Mail4Rosey: Change Your Water Color! Shower Wow! This shower head requires no batteries at all, which I think is great. The LED lights are powered by the water. It's easy to install too. What you see in the picture is exactly what you have to install. Inside of the box you will find a shower head, the instructions, and a removable plastic cap on the end of the faucet. you see what I see in the photo above. Simply screw on the shower head and voila', you're in business. It's really that easy. If you have kids in the house, it's a super fast, super affordable way to make them happy, every single time they take a shower. :) Great gift idea too! You can purchase Shower Wow on their website, and you can visit their Facebook to see the latest news. Shower Wow! is also available at Walmart and Bed, Bath & Beyond. Do you have someone in your life who would be tickled pink to have this installed in their shower? That's crazy cool! I think any kid would like this! 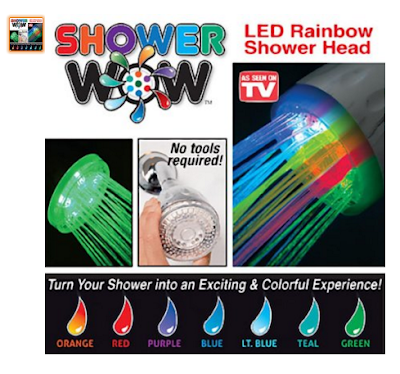 It would feel like you're showering with Kool-aid. You could freak people out by setting it on blood red! Oh the kids would love this! Looks like fun. And not just for the kids. My girls would NEVER get out of the shower with this! I don't know if that would be a good thing or a bad thing lol!